Another Festival week has come and gone with Manx ladies putting up good performances throughout the week, having representatives in the latter stages of most events. The Ladies’ Tourism competition finished on Thursday morning, starting with the quarter-finals with Lil Smith, Janet Monk and Jenny Moore still in contention. Unfortunately Lil and Jenny were playing each other, while Janet faced Diane Harrison. Jenny and Janet faced each other in the semi-final with Jenny going through to meet Alexis Lunn-Gadd in the final. Despite winning the first three ends Alexis struggled to match Jenny who came through to win 21-11. In the main event Helen Martin and Philippa Taylor both made it to finals day. It is fair to say that Helen was not at her best against Karen Galvin (the eventual winner) in the quarter-finals, while Philippa met Karen in the semi-final where she went out after a strong performance, reaching 17 against Karen and taking the trophy for the best performance by a Manx player. Lyn Bolton lost in the semi-finals of the ladies consolation to eventual winner Veronica Lyon, while our ladies were well represented in the doubles events. In the semi-finals of the ladies’ doubles Chris Price and Julie Johnson (Stavely) put out Tricia Bull and Gill Simm (Kings Arms Hale) while Elaine Moore and Alexis Lunn-Gadd (OFH) came through against Paula Gamon and Charlotte Buckley. In the final it was Elaine and Alexis who came through to win 11-6. In the Mixed doubles the winning pair contained another Manx player as Janet Monk won with her partner, Kevin Shaw (Westhoughton). There were eight pairs entered for the Dorothy Piearce ladies’ doubles played at Finch Hill on Sunday 25 June, where players were competing for the honour of representing the island on the mainland later in the season. The afternoon started at the quarter-final stage where, although each end was closely contested the two pairs, Jenny Moore and Shelley Kennish, together with Elaine Moore and Fiona Kennish won by convincing scores to get into the semi-finals. The other two quarters were much more closely contested. Rita Callister, who is becoming someone to fear in ladies’ doubles, and her partner Debbie Leece just lost out to Chris Price and Kellie Maddrell-Reeve 18-21, while the other quarter-final went all the way with Festival semi-finalist, Philippa Taylor, and her partner, Joyce Ogden, just getting past Lynda Cadamy and Mary Alderson 21-20. In the first semi-final Shelley and Jenny got off to the better start, leading 9-4 after nine ends, Chris and Kellie starting to pull back at that stage and taking the lead, 12-10 after 16 ends, having the edge from then on, coming through to win 21-14. Again the ends were closely contested in the other semi-final, but Philippa and Joyce proved too consistent for Fiona and Elaine winning 21-8. Semi-finals: Chris Price and Kellie Maddrell-Reeve 21, Shelley Kennish and Jenny Moore 14; Philippa Taylor and Joyce Ogden 21, Fiona Kennish and Elaine Moore 8. Philippa and Joyce got off to a flyer in the final, reaching 8-0 after four ends, The next few ends were evenly contested but Chris and Kellie struggled to close the gap , lying 14-6 down after fourteen ends, with Philippa and Joyce moving to 18-6 after a further three ends. The Port St Mary pair scored 8 on the next four ends but it was too little too late, the final score seeing Joyce and Philippa qualifying 21-15. The Association would like to thank Finch Hill for the use of their facilities for this event. The sun shone for most of the afternoon on Saturday 24 June when 25 players gathered at Marown for the Julia North ladies’ singles, although a bitter wind meant it was cold in the shade. There were some close, and some not so close, games played in a friendly atmosphere. The feature match in the semi-finals was between Chris Price and Joyce Ogden, which was nip-and-tuck all the way with Joyce getting to 20 first. As we all know, that last point is the hardest to get and Chris came through from 19-20 to progress to the next round 21-20. Quarter-finals: Lynda Cadamy 21, Philippa Taylor 18; Margaret Tasker 21, Lil Smith 15; Chris Price 21, Joyce Ogden 20; Maureen Payne 21, Mavis Franks 11. Maureen had no answer against Chris, with Chris coming through 21-14 despite Maureen’s best efforts, but the other semi-final was a much tenser affair with the advantage changing hands several times. In the latter stages Margaret seemed to have the upper hand with a 19-16 lead, before Lynda won the next four ends to record a 21-19 victory. Semi-finals: Chris Price 21, Maureen Payne 14; Lynda Cadamy 21, Margaret Tasker 19. In the final Chris had the better start, leading 13-7 after eight ends. Although Lynda won the next three ends Chris won the following four to hold the advantage at 18-10. The final six ends were shared, seeing Chris come through to take the trophy 21-15. Rosie Winckle thanked all those who had entered and those who had stayed to the end to watch a very good final. Thanks also went to the Marown ladies for all their hard work. There were only three matches played in the C Tarleton Hodgson sponsored ladies’ league on Friday 23 June, with the South Ramsey green being used for the Super 32 event, members of Nobles wishing to attend the event and the match at the Mooragh being rained off. Unfortunately Ballaugh were a player short for their journey to Marown and a match which turned out to be a low scoring affair. The eight games played were shared, but with Ann Gale and Pat Mason winning to single figures, Ballaugh ended just eight points adrift despite giving a game away. Port St Mary had the better of their “local derby” against club mates Purt le Moirrey, winning seven of the nine games. The two winners for the “home side” were Brenda Hawkard against Margaret Tasker, 21-17 and Edwina Reid who had the better of Ann Maddrell 21-19.Debra Cooper almost gave them a third game reaching 20 against Wendy Kennaugh. Onchan put up a spirited performance against Castletown, just losing out 4-5 on games – it was unfortunate that four of Castletown’s wins were to single figures, giving them an advantage of 50 points. 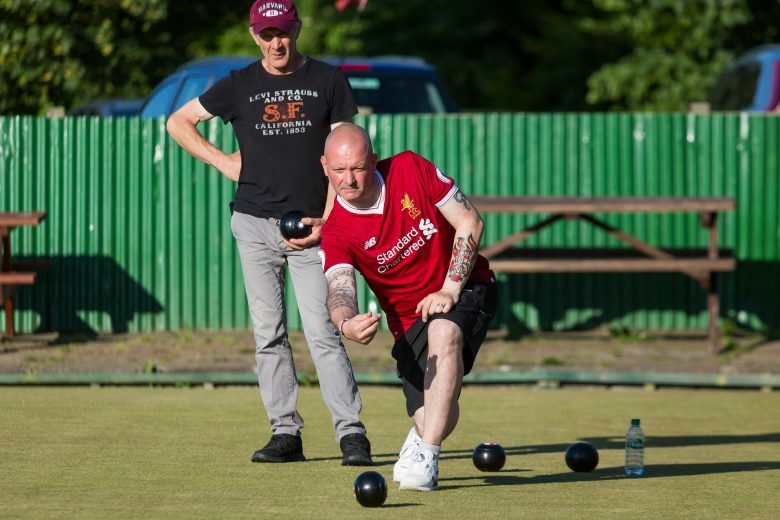 With TT week over all three divisions featured this week in the Ellan Vannin Fuels sponsored Mens League before another week off for the June Bowling Festival. Tie of the round on paper was Onchan A vs Port St Mary A. Port St Mary had two of their strongest players missing and Onchan eased to a 7-3 win beating the southerners by 39 chalks. Matthew Quirk and Jordan Cain both won to single figures and Trevor Quayle maintained his 100% record. Stand-in and stand-out performer was Steve Franks who beat Phil Kerruish 21-18. Title favourites and defending champions South Ramsey A picked up a comfortable 8-2 win on the road at Castletown A. Dave Hollingworth beat Stefan Kelly and Peter Oates came from 18-12 down against Dave ‘Dido’ Kelly running out 21-18 to salvage some points for the Balley Chashtal men. Marown A remain second after their visit to Mooragh Park to play North Ramsey A winning both halves of the match 3-1 to take the aggregate and an 8-2 win back to Crosby. The final match score doesn’t reflect a couple of the games with both Neil Withers and Colin Kelly lying game down before winning 21-19 and 21-20 respectively. Geoff Porter and Tony Smart picked up wins for the home side. Peel Sunset A bounced straight back from losing last week to defeat Port Erin A 9-1. There were big wins for Peel in most of the games but Seamus Whelan 20 and Steve Durcan 19 came close to snatching some precious points. Peel remain third but sit out the next round of matches and will wait to see where they are at the half way stage. Douglas A went over the mountain to face South Ramsey B and despite winning 7-3 will feel they missed out on a 9-1 win having lost two games 21-20 with Ben Dugdale and Sid Bolton sneaking over the line against former home greeners Gary Conwell and Andy Kennish. In Division Two Onchan B still lead the way at the top at the after a 7-3 away win at North Ramsey B.
Nobles B faced up against their A team and incredibly won 8-2 to keep themselves in third position and challenging for promotion. Port St Mary C were hoping to create a similar derby upset against their B team but it wasn’t to ‘B’ as they went down 7-3 and by a large 44 chalk margin. Port St Mary B finally close to within a point of the C team in the league and will be hoping to kick on after a poor first half of the season. Finch Hill A have struggled making their home green a fortress this season, but will be happier following a 7-3 win over promoted side Port Erin B. The gap now at the bottom of Division Two is over 20 points with both Douglas C and Onchan C well off the pace. Douglas C went down 9-1 away to Peel B whilst Onchan C lost 8-2 home to Marown B. Both will be staring down the barrels of relegation in September without a massive turnaround. Another club derby took place this week with Ballaugh B taking on their C team who sit 20 points ahead of them in the league. The match must have been a thriller with the two sides playing out a true draw 4-4 on games and 136-136 on the chalks. Youngster Patrick Grant continued his impressive form beating Dicky Watson 21-20 in a game which was the difference between a 5-5 draw and a 7-3 loss. With a week off for festival the league will return on the 26th June for round 13 and will complete the first half of the season. No matter what results are thrown up South Ramsey A will be top of the League going into the second half of the season and are favourites to retain their title. Marown A and Onchan A will fight all the way for top spot and Peel A, Douglas A and Port St Mary A will not give up their own pursuit easily of a top three finish. The week of the 26th also sees the Quarter Finals of the Rayner Shield and Plate. Tie of the round in the shield sees Port St Mary A making the trip away to South Ramsey A who have not lost a home match since July 2015. On that night it was Port St Mary A who defeated them 7-3 picking up the aggregate by a single chalk. In the Plate Port St Mary B have setup a southern derby against Port Erin B and the sole remaining Division One team Ballaugh A are away to Onchan C.
The Ladies’ Association Pre-Festival open took place at Port St Mary on Sunday 18 June, sponsored by the Slinger family in memory of their mother, Lilian , a stalwart of the Manx bowling community, who died last year. The event attracted a field of 52 which included 19 visitors. The weather suited the occasion, but many competitors were caught out by the very fast green. Quarter-finals: Natalie Hughes (Crossgates) 21, Ann Maddrell 19; Pat Shevlin (Birchfield) 10, Rachel Quirk (Crossgates) 21; Sarah Varley (Rishton) 21, Jayne Kneen 12; Janet Monk 21, Jenny Moore 19. In the first semi-final Rachel was in control from the start with Natalie unable to get her nose in front at any point, while in the other Janet had a slender lead after seven ends at which point Sarah took control to run out the winner. Semi-finals: Rachel Quirk 21, Natalie Hughes 12; Sarah Varley 21, Janet Monk 13. Sarah was 12-9 up after seven ends at which point the two players shared ends, with Rachel getting a greater number of 2‘s to levl up the score at 16-16 after fourteen ends. Three singles meant Sarah got to 19 first, before Rachel replied with two singles. Winning the next two ends gave Sarah the game to become the first winner of the Lilian Slinger trophy. Association Competition secretary, Elaine Moore, thanked Port St Mary for the use of their green, their help on the green and also the amazing raffle and food, before thanking the Slinger family for sponsoring the event and introducing Peter to make the presentation. This years June bowls festival is a very different one for me as it my first as a non resident of the Island. I have always been filled with anticipation and excitement of the top class bowling an atmosphere the coming week held in store, but to actually be one of the visiting holiday makers has stepped things up to another level. I now understand what all the pro Isle of Man bowls week Facebook statuses from the UK bowling fraternity are all about, I literally can’t wait for it, so when I was asked to write the preview for it I was like a kid in a sweet store and grabbed the opportunity with both hands! Some things never change however and as always when I run through each section of the draw to pick out the potential winner I am awestruck by the quality of the field and the number of potential victors. This is going to be a great competition. In my heart I will always want a Manx winner and I think with events out of their control meaning they had to pull out of the County Championships it would be fantastic if we had one this time around. For most of them this year the two bowls festivals are their only real chance to have a seat at the games top table and take on the best of the best. The first section of the draw is simply littered with players wanting to make their mark and claim the main prize. Visitors Paul Bailey (Meersbrook) and Callum Wraight (Castlefields) will fancy their chances of going a long way and the winner of Lee Johnstone (St Oswalds) and Danny Ferris (Norton BC) could also have a very good week, Jordan Cain (Onchan) and Stuart Garrett (Douglas) are two locals who are more than capable of making a finals day appearance. It gets even more difficult to predict what will happen in the next section and you can never write off Andy Spragg (Callow BC). The charismatic Steve Freer (Castlefields) would be a very popular winner with both locals and visitors alike as he always brings his unique flair to the party. Mark Hughes (Crossgates) is now regularly making it to the latter stages and there is no reason why he couldn’t do it again. Young Conor Chamberlain could also go well if he finds his form. From a local perspective we also have a players capable of mixing it with the best in the shape of Kevin Quirk (Onchan), Dave ‘Dido’ Kelly (South Ramsey) and Rob Monk (Onchan). There are former winners and runners up everywhere I look as I scroll down the page and defending champion Kez Smith (Crossgates) will have his work cut out to retain his crown with the likes of Kevin Shaw (Westhaoughton), Carl Armitage (St Oswalds), Chris Barton (Wirral) and Colin Kelly (Marown) all in close proximity. Don’t be surprised to if Stevie Kelly (Peel) turns a few heads and causes a few surprises. There are chances in the next section and for me it’s wide open. Another former champion Gax Lalley (Crossgates) will fancy his chances of making it to the latter stages however in form Trevor Qualye (Port St Mary), who currently leads the local division one merit, has the potential to do very well indeed. Wayne Ditchfield (Kirkham) and Dave Jackson (Railway) will both expect to make it to the latter stages however there will be only room for one of them, that is of course if the get past local David Bradford (South Ramsey) who on his day can beat absolutely anyone and everyone. Jack Dyson (Thongsbridge) will be hoping to add his name to the trophy however with seasoned campaigners such as Martin Gilpin (Kendal Vic), Rich Goddard (Castlefields), Rob Fitzpatrick (Wirral) and Marown’s Neil Withers all on the same page it would be a very good week at the office if he was to leave with the crown. Ian Nicholson’s (Kendal Vic) name jumps of the next page and hits me between the eyes as the man most likely to be in the final shake up from the next group, however it will be interesting to see how Billy Speed (Castlefields) and young Stefan Kelly (South Ramsey) fare. Stuart Mort (Kirkham) and Matt Kelly-Wally (Belvedere) will both fancy a long run out over the week however experienced locals Dave ‘Barney’ Kelly (Peel), Phil Kerruish (Onchan) and Manx Championship runner up Pete Slinger (Onchan) will all be wanting their own day in the sun on Friday. News has filtered through to me that local favourite John Kennish (South Ramsey) is unable to take part in the competition this year due to work commitments which really opens up the next section of the draw. I can’t even begin to work out who will make best use of this and it will definitely pay dividends for someone and Paul Chamberlain (Stretton Anglesey) may just be the man to cash in. James Wilcox (Crossgates) is probably favourite to make it to finals day out of the final 32 in the competition however locals Matthew Quirk (Onchan) and Matthew Keggen (Marown) are both well placed to stop him. Well that’s it for now, draw analysed and like me you are probably no clearer to picking a winner than I am. What should shine through, however, is the quality of the field and the week of bowls we have in store for us and as I said at the top I literally can’t wait for it to start. The traditional curtain-raiser to the week-long Bowling Festival took place on Sunday on a fast and tricky Castletown playing surface. 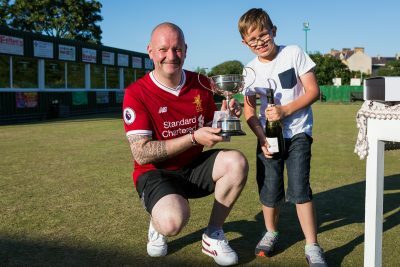 The event has taken an upsurge in popularity in recent years which has prompted the organisers to limit the entries to 96 and from this star studded field it was a previous Festival winner Mark Hughes from the Crossgates club in Leeds who took the honours beating Nicky Burridge from the Wirral 21-16 in a see-saw, quality final. In the final stages which were dominated by visiting bowlers Hughes had beaten Ian Johnson (Calow BC, Derbyshire) in one semi while Rishton’s Mick Lee fell to Burridge in the other. 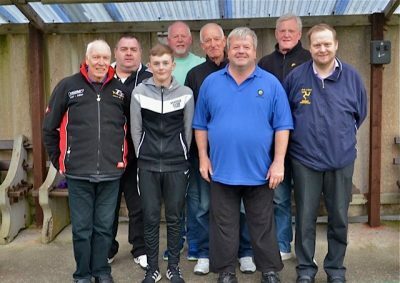 Only one local bowler reached the last 8, South Ramsey’s Glynn Hargraves, while the other losing quarter finalists were Wayne Jeavons (Wirral), John Colebourne (Calow) and Keith Middleton from Chapel Park BC. At the end of the prestigious competition the home Club’s President Ron Williams mentioned how grateful the club was to Denny Oates and his daughter Kath Kinley for organising the event and he also thanked the club members who had worked through the day. He finally spoke about the magnificent sponsorship provided by Friends Provident International before introducing company official, and local sportsman, Adam Drewett to present the prizes. 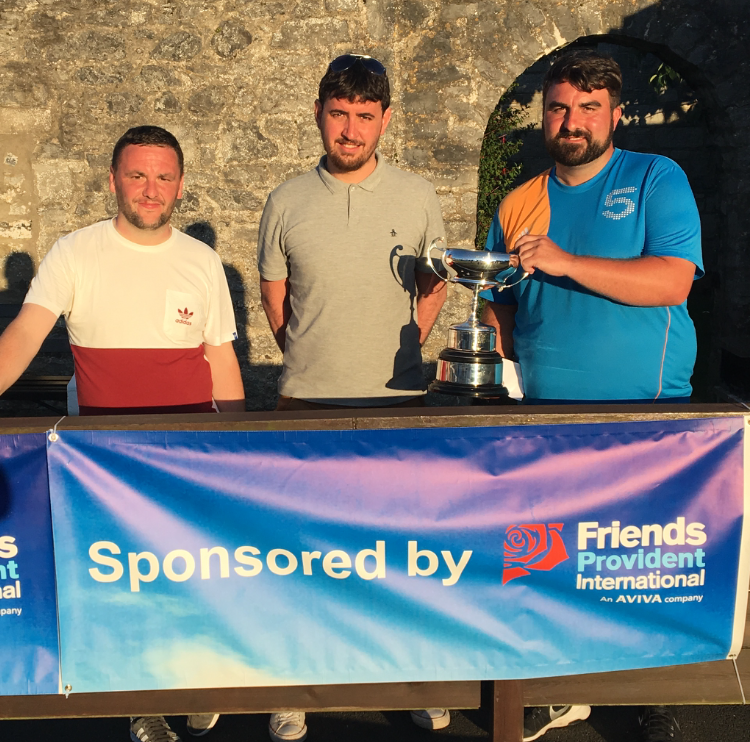 The first of the pre-festival opens The Jim Kernan Cup was held in glorious weather on a fantastic South Ramsey green that got quicker throughout the day. The competition attracted an entry of 48 bowlers, which was half price entry for Over 60’s and free for Juniors. The winner was John Kennish, who mastered the green and made it a staggering 11th time that he has picked up the trophy on his home green. Losing out at the quarter-final stage were home greeners Steven Waters, David Bradford and Glynn Hargraves, along with visiting bowler Keith Turton. In the semi-final Kennish ended the challenge of visitor Roger Lunn. In the other semi-final home greener Dido Kelly booked his place in the final by defeating Edward Carlyle (Onchan). In a good quality final Kelly got off to a good start against Kennish, before Kennish turned the game round to go 16-12 up. Kelly then dug in to pull the score back to 15-16, before Kennish rallied to see the game out 21-16. The presentation was made by Steve Moore, who thanked the sponsor George Brew and his family, those who helped run the competition and the Ladies for the excellent refreshments throughout the day. This was the first open that South Ramsey have held using their new clubhouse.